The church of St. Sofia is one of the largest medieval churches in Macedonia. The church was originally built in the 10th century with the fresco paintings from the time of its foundation. Later the church was either built or restored during the period of the Archbishop Leo who was on the throne of the Church in the period from 1035-1056. For a long time it was the cathedral church ("Great Church") of the Ohrid Archiepiscopate. With the arrival of the Turks, the church was converted into a mosque. After the extensive conservatory and restoration activities the fresco paintings were offered to the light of the day. These preserved frescoes from XI, XII, and XIV century are amongst the highest achievements in medieval painting in Macedonia and the most important works of Byzantine monumental painting. The church of St.Pantelejmon also called Plaoshniк This place has been a very important religious centre since early Christian times. This is the place where the first university in Europe in the 10th century was established and it is the place where the Cyrillic alphabet was created. Today the church is a reconstruction of the original church built in the 893 by St. Clement, the pupil of St. Cyril and Methodius and it is dedicated to St. Pantelejmon (protector of health). St. Clement died in 910 and was buried in the church where the visitors can see his grave. Later the church was ruined, and on the same place in the 17th century Sultan Mohamed Mosque was built. Only the fragments of the fresco paintings from pernicious periods were preserved. The reconstruction performed in 2002 was made on the original church of St. Clement where through the glass the parts of the original church from 9th c. are still visible. The antique theatre was built in the 3rd century BC and later it was adapted and used by the ancient Roman. It could received 4 500 to 5000 spectators. After abandonment of the theatre, elements of the building material were used for the construction of other buildings. The reconstruction was completed in 2002 and after restoration today it hosts a lot of different events and functions. The church of Virgin Mary Perivleptos (also called St.Kliment) dedicated to the Mother of God, was erected in 1295, and the frescoes painted by Mihailo and Evtihij represent the earliest example of Renaissance art in Europe. The temple is known also as St. Clement church, because in the time of the Ottoman Empire the bones and relicts of this saint were transferred within the church. They were kept here until 2002 when they have been brought back to the original church of St. Clement at Plaoshnik. In the courtyard of the church the masterpieces of Ohrid icons collections are settled. 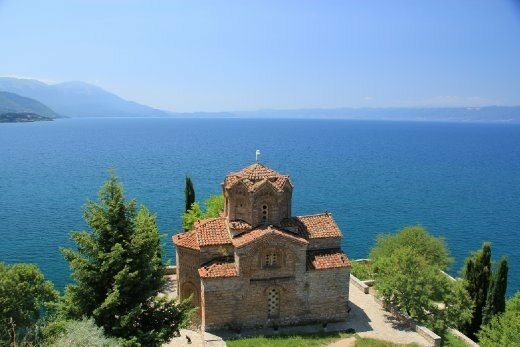 The church of St. John - Kaneo is the church dedicated to St. John the Theologian - Kaneo is located on the south-western side, on a cliff hill surmounting Lake Ohrid. This temple has become one of the symbols of Ohrid, thanks to its marvellous location. The original church was built in the 10th century, but today the church has preserved fresco-paintings from the 13th century. 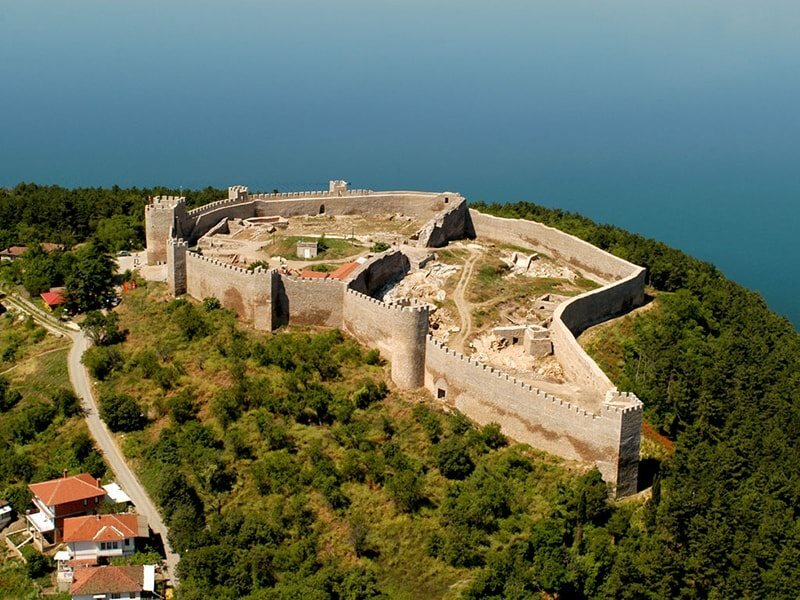 Monastery of St. Naum of Ohrid is the monastery which Saint Naum was built on a rock, with a wonderful view of Lake Ohrid and of the surrounding mountains from Galicica National Park. The original church dedicated to the Holy Archangels Michael and Gabriel was erected by St. Naum himself in 900 A.D. The pupil of St Cyril and Methodius died in 910 and he was buried in the monastery within the church. 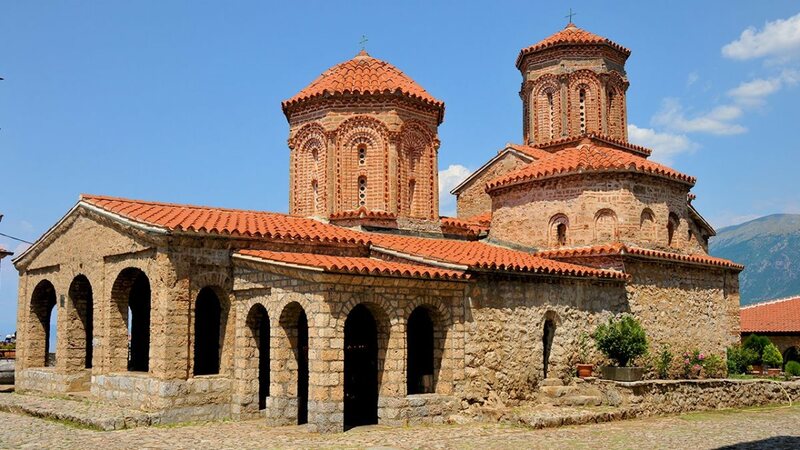 There is one interesting legend connected to this church, a popular belief that if a visitor puts his ear on St.Naum’s grave he could hear his heart beating. The church was demolished in the Ottoman period and was renovated and reconstructed several times. Museum on water is located in the Bay of the bones, this open air museum represents reconstruction of a prehistoric (Bronze Age) pile-dwelling settlement discovered on the same place due to underwater archaeological excavations. Within the complex there is a small museum with a small exhibition of the discovered artefacts, as well as a Roman military fortification in the vicinity which has been reconstructed on the hill above the Bay of Bones and once had protected the Roman Empire from its enemies. The church St. Virgin Zaumska originally dates from 1361. It is built in a vibrant style, with preserved fresco painting from the period of foundation. The restoration work has been done to the church and it is in good condition, attracting visitors, both by lake and from the trails in the mountain. The Island of Golem Grad is also known as Snake Island due to all the water snakes that live around the shores of the island. 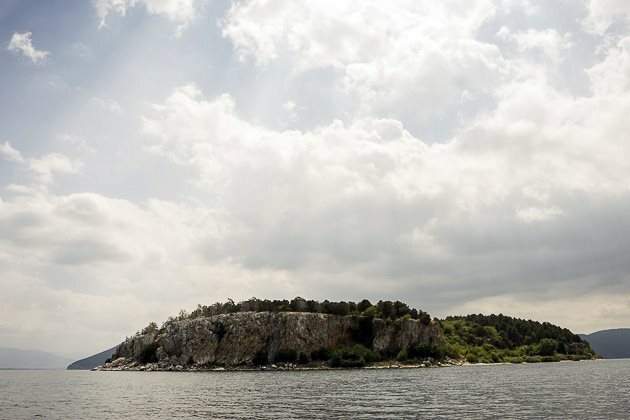 The island is now uninhabited and is part of the natural reserve of Galichica National Park. The single-nave church of St. Peter, with fresco paintings dating back to the 14th century, can be found on the island. Archaeologists have discovered remains of several other churches built here in the period between the 10th and the 14th centuries. 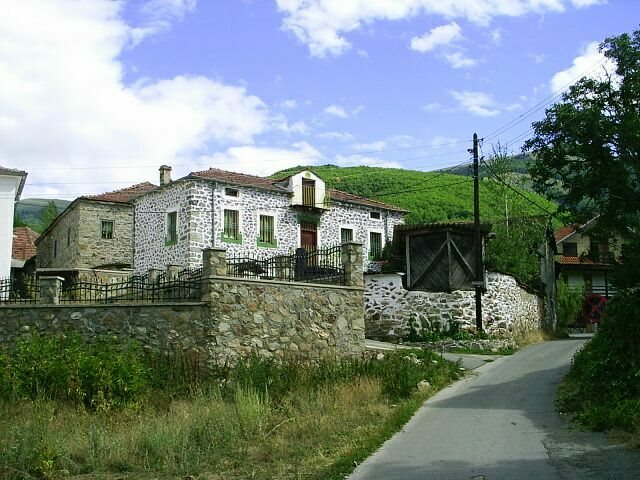 The village of Brajchino is situated 6 km from Lake Prespa in a valley on the edge of Mount Pelister. Brajchino is a mountain village at an altitude of about 1,000m above sea level. If you take a walk through the village, you can see its picturesque old architecture, including six churches and the monastery of St. Petka, which reflects the Macedonian tradition. St. Petka Day, 8th of August, is a village festival. The village Kurbinovo is situated on the slopes of the beautiful Mount Pelister near the blue waters of Lake Prespa with the small, but charming single-nave church of St. George, dating from 1191. Three unknown artists painted the gallery of this church with saints and compositions that describe the 12 big holidays and the life and miracles of Christ. The fresco-painting is from the period of its foundation and represents a true masterpiece of Macedonian painting from the 12th century. The monastery in the village of Slivnica is dedicated to St. Virgin Mary and the church within this complex was built in 1607 when it was fresco painted. A narthex was built and fresco painted in 1612, but it was damaged and in 1645 some frescoes were covered with new paintings. The iconostasis has been preserved in its authentic state with its throne icons, the Royal Doors and the Holy Cross carved in wood. Outside, there is a spring of holy water with miraculous healing properties. This ethno museum is located in the village of Podmochani, in the private house of Jone Eftimovski. It includes one of the richest ethnological collections in Macedonia with more than 2000 art items including: unique examples of jewellery, weapons, coins and more than 160 different Macedonian traditional costumes from different regions of Macedonia. The Bird sanctuary in Ezerani covers the northern coastal area of Lake Prespa, at 885m altitude above sea level and is protected by law. The protected area covers 2080 ha. Almost all bird species existing in the Prespa Lake area are building nests, feeding, resting and finding shelter here. It is a home to approximately 200 bird species, including wild geese, pelicans, and local moorhens, which live and nest in the area; 62 species of these birds are on the list of protected species according to the Bern Convention, while three of them are on the European Red List of Globally Endangered Species. This Mountain separates Lake Prespa from Lake Ohrid and it was declared a national park in 1958. It covers an area of 22,750 hectares. The highest peak is Galichica, which sits at an altitude of 2,275m above sea level. The mountain is very rich with fauna (bears, chamois, boars, deer and several species of birds) and there are around 130 species of trees and bushes, which is quite unusual for this part of Europe.